At the end of the Ice Age, the world climate was warming very rapidly -becoming as warm or warmer than today by about 10,000 years ago, when the great glaciers were still very large. This warming caused the northern lands to be flooded with water, and turn former reindeer tundra into marshlands, lakes, rivers and seas. Reindeer hunters had to give up their tradittional reindeer hunting and adapt to the watery environment, including boats just to get around. Although humans were smart enough to devise rafts to cross bodies of water we are not by nature water-creatures; thus the evolution of a part of humanity into a life using boats and getting around on water could not have occurred spontaneously just anywhere. It had to have occurred in a place where there was no other alternative; where survival depended on it, and the pressure lasted many generations. Through natural selection those groups who devised the best ways of dealing with the watery environment were the ones who produced the largest populations and flourished. The following presents the basic story - including some original discoveries - about the appearance and expansions of a boat-oriented way of life that marks an early stage in the evolution of Europe after the Ice Age. This side of the European past has never before been told, because traditionally scholars have focused on the land migrations and the evolution of farming and sedentary civilizations particularly in the Indo-European tradition. Everyone imagines that European civilization owes its existence to farming, but it owes as much to the development of boat-oriented ways of life as it created the transportation and trade that tied the civilization together. The story begins at the height of the Ice Age, when glaciers cover the entire north part of Europe. In southern Europe there were people who lived in caves and hunted bison, horses, reindeer and other large animals who lived in plentiful grasslands or steppes, or towards the north permanently solid tundra. Map 1. The Ice Sheet over the north of Europe. Humans who followed Reindeer, Bison, Horses, Aurochs (wild cattle) and other migrating herds were distributed according to the migration patterns of these herds. Missing from the map is mammoths, but mammoths became extinct in the course of the Ice Age retreat . As the Ice Sheet withdrew and humans began expanding northward, the first split was between the reindeer hunters who occupied the tundra of the North European Plain, and the descendants of the horse and bison hunters who were forced to adjust to the disappearance of grassy plains and plains herds. But when the Ice Age came to an end, the climate warmed, and the southern parts of Europe became increasingly forested. Grasslands and steppes vanished, and brought an end to herds of many of the steppes animals. Bison and horse herds migrated into Eastern Europe where the climate remained dry and there were still open country with grassy steppes.. (Possibly those hunters who followed them were the source of the ' Indo-Europeans' who adjusted to the decline in large animal herds by starting to manage them - the first step towards domestication.). On the other hand reindeer were animals who lived on the tundra plain north of the tree line. Forests could not swallow up tundra in the same way they could swallow up steppe grassland, because trees could not grow in arctic conditions. Thus there was always a northern limit to trees, and beyond that a tundra plain which could be inhabited by reindeer. Those humans who sought to continue the way of life of the Ice Age, needed only to shift north with the reindeer as they kept north of the tree line. The story of the boat people begins with the reindeer hunters. Archeology reveals that the latest reindeer hunters in continental Europe were in the region of Germany and Poland around 13000 years ago. These were about 90% dependent on reindeer, and therefore had needed to follow the reindeer north as the climate warmed. The northward shift would have been so gradual the reindeer people would not have been aware of it; but over hundreds of generations the northward shift added up to a great distance. By about 8000 years ago they would have been in the northermost reaches of Greater Europe. As long as their circumstances and way of life was unchanged they carried forward the original language and culture of homo sapiens of the Ice Age. During the continuous northward shift of the tundra, the reindeer hunters remained in arctic conditions. Staying in arctic conditions the reindeer followers continued to develop increasingly pronounced mongoloid features, which are considered adaptations to the arctic. (Eye squint against glare of snow, flat face to prevent wind flowing over the face, squat body to reduce heat loss, etc. On the other hand, those people of the Ice Age who abandoned the arctic conditions early, did not have the natural selection forces on them and so, in southern Europe, the arctic racial features are absent. It follows that the modern peoples with highly arctic mongoloid features and traditions of reindeer hunting/herding - such as the Samoyeds of arctic Russia - are descended from the reindeer hunters. We can also include the reindeer Saami in arctic Scandinavia today.. The Samoyeds around the Tamir Peninsula are quite separated from the Saami of arctic Scandinavia and one might wonder if it is valid to link them together. In my view the Saami represent a mixing at a later stage between reindeer and boat peoples in arctic Scandinavia. As you will see later, when the glaciers shrunk over Scandinavia, the northern part was free first and it would have been at that time that the Reindeer-Saami ancestors entered the arctic regions. While the reindeer people were gradually following their herds northward and the North European Plain turned into bogs, lakes, and forests, the descendants of the people who remained behind were adapting to new conditions. How did some of the reindeer people get left behind? 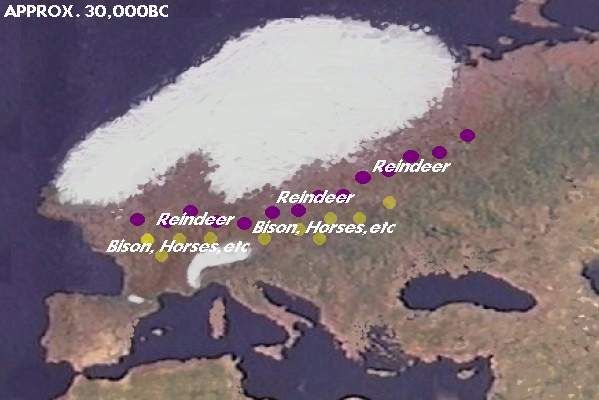 Whereas the reindeer herds and their hunters could easily shift northeast and stay above the tree line from the region now Poland (look up the archeological Swinderian Culture), towards the west, in what is now Germany) the reindeer were unable to continue north as the sea blocked the way, and these reindeer hunters (look up Ahrensburg Culture) were the first to have to adapt to the warm, waterlogged, landscape. The last of the Western European reindeer herds were hunted almost to extinction in the British Isles. As the originally solid frozen land turned to bogs and forest and the reindeer herds dwindled, the tribes in these regions had to gradually turn to other animals to survive. From Poland west to Britain, humans soon found themselves in a marshy land where it was difficult to walk . That began the environmental pressure that promoted a way of life moving about in canoes made from logs. This original boat-people culture has been called the Maglemose Culture. Not all the reindeer hunters in the region of Poland (Swinderian Culture) had been able to continue with the reindeer and, borrowing from the dugout boat innovations of the expanding Maglemose Culture, they made large dugouts capable of going out to sea and hunting seals and whales. Perhaps colonies of seals or walruses reminded them of herds of reindeer and they were able to transfer skills in hunting reindeer to hunting sea animals like seals. It is important to note that in reindeer hunting there may have been the practice of ambushing reindeer from rafts as they were crossing rivers. This would be a precedent that would be useful. Creating a boat for hunting was not completely without precedent. These first seagoing boat people are archeologically known as the Kunda Culture. These descendants of both late Swinderian and early Maglemose Culture were, like all boat people became, extremely mobile (since they could travel much further and faster in boats than even reindeer hunters on solid ground on foot). Like all hunter-gatherer people at any time in history, they had a sense of ownership of the lands and waters in which they hunted and it was their territory. They managed and defended their territory - each family in a tribe their subterritory - from rival tribes. But because of the mobility their range was very large. Judging from similar situation in North America with canoe-using Algonquian people a few centuries ago, the range of movement could be 3000 km wide, along the paths of water routes, of course. The Kunda Culture was about 1000 km of coast, and extended up into what is now Finland, and probably east as far as Lake Onega. But these were seagoing people. They were more likely to expand, when their populations grew, up to the arctic ocean. The dugouts intended for rivers and lakes, had probably already been expanding since the Maglemose Culture, because archeology has found evidence of that kind of culture on banks of prehistoric rivers and lakes, as far east as the Ural Mountains region. Thus the Maglemose Culture was the beginning of the boat peoples. During the several thousand years since it emerged around Denmark, around 11,000 years ago, it expanded eastward through all the marshy interior regions. The seagoing offshoot, the Kunda Culture, began a second trend which saw boat people expanding north to the arctic ocean, and inventing skin boats because the trees were too small for making large seagoing dugouts. Thus to summarize, the best theory to explain archeological discoveries as well as the results in surviving languages. is that the boat people began as people who were unable to continue as reindeer hunters in the central and western parts of the North European Plain and gradually adapted to a watery and forested landscape which featured dugout canoes to get around. Archeology sees the new way of life in the Maglemose culture and Kunda Culture, then sees this culture spread eastward via the waterways changing slightly with new circumstances. Archeologists like to give different "culture" names based on location,. or some special material culture feature, but the original expansion was still essentially the Maglermose Culture. The expansion occurred during about 11,000 - 8,000 years ago. During that time all the waterways connected to the Baltic and North Seas (the regions of the Maglemose and Kunda origins) would have been explored and all the new tribes that arose from the population explosion would have found their place within various water systems (since they travelled by canoes). Because boat people travelled so widely,.with range of seasonal migrations maybe 5 times larger than what was covered earlier by the reindeer hunting people, they would have had frequent contact with other tribes, and when there is contact over such large distances, the language will tend to be quite uniform. (A good example would be of course the wide distribution of the Algonquian languages covering the northeast corner of North America. The Cree language for example, covered 3000km around Hudson Bay, with only three dialects. Just to their south were the Ojibwa (Anishnabe) whose language was close enough to Cree to communicate. The evidence is there that there was a common language similarly in boat oriented hunter-gatherers in the region between Scandianvia and the Ural Mountains, with only dialectic variation according to different water systems. What was the language of the original boat people? THE MELTING GLACIERS CREATE A WATERY LAND : "UIRALA"
At the peak of the Ice Age, the glaciers descended to the central part of continental Europe. Geologists tell us that as the glaciers developed they drew water out of the oceans and lowered the sea level. When the climate began to warm, when the Ice Age receded, when the glaciers melted, the sea level did not rise immediately because the glacial meltwater first spilled into the land and inland seas and it would take some time for the water to flow to the sea and raise its level back up. Thus there was a period of time during which the lands below the glaciers were inundated, and any hunters found there would have no choice but to develop ways to travel on water. Gradually they adapted and soon they had access to a rich bounty of fish, sea-mammals, and waterfowl, not to mention animals that like water like the "moose" (American English) or "elk" (British English). Paleoclimatologists tell us additionally that the Ice Age receded initially slowly, and then accelerated. For 10,000 years climatic change was barely perceptible, but then around 10,000-6000BC the warming was very fast. The reason for this is that when most of Europe was covered with glaciers, its white color reflected the sun's rays back into space. But as the melting progressed and the dark colors of the earth were exposed, less sunlight was reflected back into space, and the heat gain of the earth accelerated, causing the glaciers to melt faster and faster until in the very last stages everywhere the land was warming and the glaciers were depositing their water. Water was being dumped far more quickly than it could drain to the oceans. It was a very wet land, but the boat-using hunter-fisher-gatherers flourished, probably more than any other people. It an be argued that the boat-people became the dominant group in Europe. I call their watery world UI-RA-LA. It's peak of expansion was at about 8000 years ago. Then climatic warming slowed down again, the glaciers disappeared, water flowed into the sea, and things stabilized in subequent millenia. From the Preface, I show the following map of the region around the rise of boat peoples at the time of maximum warmth. The blue tone and blue arrows represent the initial expansion of the boat peoples. The pink tone represents actual surviving reindeer hunters and herds. The orange tone represents former reindeer hunters left in an open subarctic landscape who had to hunt other animals like moose and move around on foot as before. The boat peoples was one of the adaptations that was very successful. Less successful solutions to the loss of reindeer herds and the warm climate would have borrowed boat use, just as later in history, people borrowed farming practices. Once invented and mastered, anyone could copy. Today we take the use of boats for granted. Because today anyone can purchase a boat and go fishing, there is a common belief that boats and boat use is something that could easily arise from simply concieving of it and trying it. For example, some scholars have said the idea for a skin boat could come from watching a wicker basket float on water. But such experiments and ideas are what humans do all the time - they are just amusements or toys. Or they could be ad hoc contrivances to solve a one-time problem. The idea is never adopted into common practical uses because there is no real long term necessity.or usefulness for it. Indeed, humans have always been able to put baskets in water and watch them float. Children can even climb in them and play games. Another good example would be to ride on the back of a large animal. There is not doubt that early horse hunters may have developed a sport of jumping on the back of the wild horses and trying to see who could remain on the longest. But games, amusements.or sport would not become established in that society until this practice of riding on a horse's back became useful in the way of life in general. Another example would be the discovery of electricity. Apparently a battery had been invented in ancient times, but it was used probably as a novelty of some kind. It was a toy. Who back then could have imagined that one day there would be a world society that actually ran on electricity? The reality is that an idea does not become established in a society unless it is truly necessary and economically viable. The invention of boats had to represent improvements for a society that offset the natural reluctance of the human being to take to water. The use of boats or water craft like rafts were probably used by humans maybe back to ape ancestors, since today we can see apes devising ways of crossing a river on something serving as a raft. But these are one-time solutions to challenges, and not something of continual necessity. Indeed, the reindeer hunters from which the Maglemose and Kunda cultures emerged had probably created ad hoc watercraft to ambush reindeer crossing a river, the river slowing them down. The story of the boat people is not the invention of the boat, just as horseback riding is not the invention of it for a particular purpose, nor how weeding around wild berry plants is farming. What we must see is the practice becoming a central necessity in the way of life. Unless you find yourself living in swamps, a boat is just a novelty or an occasional practical device. Unless you live in open steppes, horseback riding is an occasional practice. Unless you live in a location where wild food cannot grow, farming is an occasional practice too. At the origin of boats you really needed a situation in which humans needed to deal with flooded lands all the time, generation after generation. Beginning with the need to cross waters to get from one island region to another, soon they found they could just as well hunt and gather water animals and plants as well. This then promoted improvements to the dugouts and the invention of new hunting practices that employed boats. Once the art and technology of using dugout canoes had developed not only did it open up opportunities to hunt and gather in watery environments, but the boat actually allowed them to travel some five times faster than even walking on clear solid ground. The degree to which the boat people recieved benefits can be the equivalent of the later advantages of farming. Today's culture of automobiles on highways, is based on an older one of horsedrawn carriages on roads, but both are ultimately based on the oldest tradition in transportation - boats on rivers. Without the boat-oriented way of life, and the results in shipping and transportation, Europe today would not be much more advanced as as large scale civilization than North America in the 17th century before European colonization. ONCE ESTABLISHED, AND PERFECTED, NO STOPPING IT. Starting new inventions and new ways of life using them, is very difficult - there have to be sustained environmental pressures, and there has to be a long evolution from crude actions to a refined way of life. That could take many generations. But once the way of life has matured and proves to be successful then other peoples can quickly copy it. Not only does the establishing of it validate it for others to copy, but new users do not need to progress through a long evolution anymore. By simply copying, they derive the benefits immediately. The development of horseback riding too, may have taken a hundred generations to develop into a central role in a society, but once it was established all other peoples could adopt it. But it had to begin in a slow way accompanied by sustained pressure. 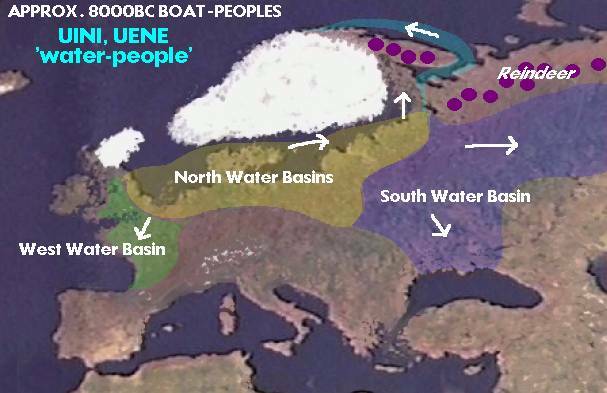 With the success in hunting and gathering, and travelling between bountiful sites, it is no wonder that the populations of boat peoples blossomed and caused tribes to divide and divide producing new tribes who travelled further and further away to occupy the still-vacant coasts of lakes, rivers, marshes and bogs from Britain to the Urals. It all makes sense. The growth of populations of boat peoples probably exceeded the growth of any other post-glacial hunting people, and such growth probably did not occur again until civilizations developed in southeast Europe. In other words, a great portion of humanity today has the boat people at their roots. It would explain our love for recreational boating, canoing, and fishing. Recreational activity tends to be connected to ancient experiences that have found themselves into our human nature. A Finnish linguist, Kalevi Wiik, a couple decades ago, proposed that northern Europe originally spoke "Uralic" (of which Finno-Ugric is the largest division). 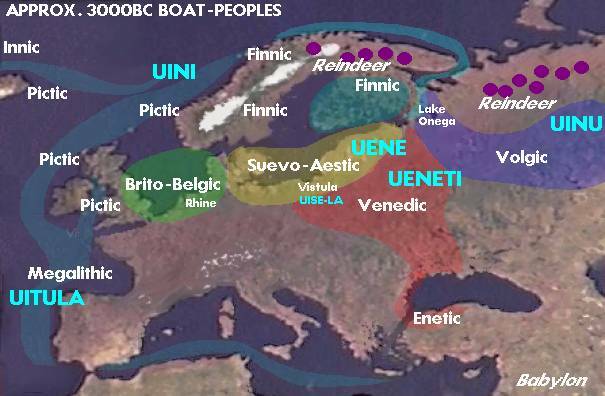 If the original boat peoples arose from European reindeer peoples, and if after the development of the use of boats, they expanded in every direction from their north European origins, then indeed, before the development of farming-based Europe, before the arrival of Indo-Europeans, northern Europe could very well have spoken Finno-Ugric as Wiik suggested, including all regions later recieving the Indo-Europeans that gave rise to Celts, Germanics, Slavs and Balts. Wiik tried, in his papers in the 2000's to imagine how the Finno-Ugric boat-using hunter-gatherers responded to the immigrant peoples, from the farmers to the cattle herders in those millenia between 10,000 years ago and about 5,000 or 4,000 years ago. That is about 5,000 years of the original hunter gatherer peoples with boats, north of the Alps, interracting with and adapting to the presence of newcomers. Could there have been an independent development of boat people in North America? Unusual developments need special circumstances and sustained pressures. Consider that North America had some large animals that could have been domesticated. An elk or moose could have been developed for uses similar to horses - but it didn't happen. And yet when the Plains Natives saw Spaniards riding horses they were quick to copy them and the North American Plains Natives were riding on the backs of horses within a couple generations after seeing Spaniards use them. When we consider boats, archeology fails to find evidence of boats in North America predating about 5000 years ago. It seems that boats did not develop independently in North America - the same environmental pressures never materialized - but were copied when the first skin boats crossed the north Atlantic from the coasts of Norway. Consider that the Atlantic coast of North America never saw the development of boats made of planks. All North American boats were either dugouts, or skin boats on frames, which includes using birch bark for skins. While northern Europe has rock carvings dated to as much as 8000 years ago, showing both dugouts and skin boats, all images in North America that show boats are relatively recent. Finland has red ochre images on rock walls that were originally beside water, and made from boats, but all the images are so degenerated it is difficult to make them out. On the other hand similar red ochre paintings on cliffs beside water in the Great Lakes of Canada are fresh enough that you can tell what the images represent. They suggest visits from the arctic coast of Norway by aboriginal people of Finnic origins (since they carried out exactly the same practice as found in Finland) relatively recently. 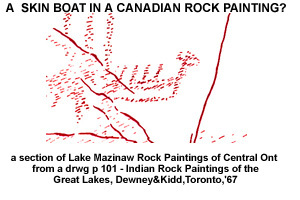 See another Uirala article for more on North American mirroring of red ochre cliff art beside canoe routes. Crossings of sea-hunting peoples took place as well, as will be discussed in a later article. The Inuit of arctic North America is an example. We will look at such aboriginal sea-hunting peoples in Northern North America for evidence of a connection to the boat peoples of northern Europe who became seagoing. Originally, boat use may have developed simply to deal with the fact that land suitable for walking had disappeared in the North European Plain between 13.000- 10,000 years ago; but once the boat had begun to develop, unexpectedly it offered great additional benefits - access to water plants and animals, and ease of travel. At the same time, the warming climate was causing the populations of wildlife to increase as well - the marshes came alive with waterfowl, fish, and even large animals like the moose. This new way of life using boats was successful, and the boat-people populations began to increase in parallel to the wildlife. Bands and tribes grew large, and daughter tribes split off from mother tribes, and migrated far enough away to establish a new hunting-fishing-gathering territory. It is necessary to understand a little about the social organization of nomadic hunting peoples - how they expanded, how they interracted. We can learn a great deal about it by what is known about the Algonquian canoe-using hunter-fishers of the northeast quadrant of North America. The most important truth for scholars to understand is that humans are territorial. You simply cannot say that a particular people migrated into another area, without considering whether there were already people there. If there were, intruders were resisted, told to move on. If they did not, there was a battle for supremacy. Scholars cannot treat the environment as if it were vacant - except in the beginning. The boat people originally expanded into virgin lands, but once the expansion had been completed and tribes were claiming ownership over wildlife in different regions, newer immigrants had to deal with those who were already there. The newcomers could move on, or agree to take marginal lands. Thus while the original expansion could cover the entire region from Britain to the Urals in 1000 years, further waves of migration had to deal with the established peoples - taking marginal lands, fighting battles over ownership, and trying to find peaceful ways of sharing increasingly limited resources. Note that in civilization we think of lands in terms of acreage for farming. Hunting peoples did not have a sense of owning nature, but owning rights to hunt particular animals. A farming people could move into the territories of a hunting people as long as they did not hunt. This is something scholars do not understand. I recently read of how scholars studying the early peoples of central Europe were puzzled that the hunting peoples did not adopt anything from the farming people in spire of contact. Partly this indicates a continued racism, where it is expected that aboriginal people ought to want to become farmers. But mostly it is because scholars do not understand that peaceful co-existence of two different peoples requires that each side remains within their own economic territory. It is interesting to note too that in Canada, the farming natives known as "Hurons" were 90% dependent on what they farmed - maize, squash, etc. They could have hunted and fished but they were closely involved with the Algonquians - the seasonally nomadic hunters-fishers. If they wanted meat, it would be more likely from trade - meat for maize. If the Algonquians did not live in the same environment, the Hurons would have been more involved with hunting and fishing. Different peoples could occupy the same landscape, as long as they exploited different resources. In other words concepts of territory could overlap in the same landscape. Farmers, traders, fishermen, crafters could - and later did - occupy the same environment as long as they were clear as to staying within their territories and respecting those of the others. It is the origins of professions. Specialization plus trade also made for a better economy for everyone involved. The nature of hunting-gathering societies is clear from what was observed of the North American Algonquins before the arrival of Europeans disrupted them The organization of hunting-gathering society is not designed by anyone, but the consequence of human nature and necessity within a particular way of life. In the basic aboriginal society humans form bands, extended families of brothers and sisters, children and elders, who then move together through a territory. But bands can meet up with bands, to form tribes. Evidence suggests that an average natural tribe had about 5-7 bands.Anything larger was difficult to maintain, without some organization. The pattern of life of nomadic hunter-fisher-gatherers is that every band moved around in their band territory throughout the year, but annually 5-7 bands would meet at a central location to socialize, trade, mate, and generally reaffirm a larger tribal social order. Thus the region of linguistic and cultural uniformity extended over the total area of the movements of all the clans of the tribe. Sometimes two or three neighbouring tribes would congregate in larger festivals, and that would counteract the development of dialects between one tribe and the next. If the territory covered by a band of boat-using hunter-fisher-gatherers was large, then areas of linguistic and cultural uniformity could be very large, much larger than is commonly assumed. An important and also unrecognized aspect of the boat-peoples is that with boats, boat-using hunter-fisher-gatherers could travel over five times faster and farther than the earlier hunters that moved on foot over clear open land. That means boat-using hunting-fishing-gathering territories could be over five times larger than that of the earlier big animal hunters, like the reindeer hunters. For example, if a reindeer hunter band covered a territory 100km in diameter, the boat-users could cover a territory of 500km in diameter with the same effort. Furthermore, since boat-use was determined by the nature of the waterways, their territories would be stretched in various ways. A linear territory could assume the form of travelling 1500km up and down a river, or along a coast. (For example, evidence of rock carvings with moosehead skin boats suggests that there may have been a tribe that migrated annually between wintering at Lake Onega and summering in the islands off the coast of arctic Norway. Lake Onega images of moose do not show antlers - proof that these people were not there in summer and never experienced antlered moose (antlers are lost in the fall and regrown in spring). TerrItory is very important in the human psyche, and it follows that if the range of tribes with boats was this large, then in the early period of expansion of the boat peoples, it is clear that breakaway bands and then tribes would have to travel a great distance to remove themselves from the territories claimed by the parent band. If families were having three children, then a breakway tribe would form every 50 years or less, and move about 500km away. They could expand 1000km in every century (The destination lands have to be unoccupied, as mentioned above for that speed) The most recent example of rapid expansion of a boat-people is that of the Canadian arctic "Thule" culture from Alaska to Greenland in only about 500 years. As I mentioned above, the original expansion (10,000 to 6000 BP) the expansion was unopposed. Before the boat peoples there were no previous peoples across the subarctic forest zone of Europe. Before the evolution of boat-peoples the water-filled forests south of the tundra were unoccupied. The only people they might have encountered were the reindeer-hunters. But the reindeer hunters were above the tree line and moved around on foot, therefore they were rarely found in the niche into which the boat-people expanded. In a sentence--the boat-peoples were unopposed and for that reason the expansion was fast! They did not have to displace any earlier peoples. They did not have to battle with people already there. This is something that we cannot understand today. For several millenia now, any immigrant had to deal with the people already established in a location. The days of simply moving into virgin lands, and occupying them, has long disappeared. Either the immigrants have to negotiate with those already there, or come with an army and conquer them. As already noted, because the territories of boat people were large, when populations grew and tribes formed out of parent tribes, the new tribes needed to travel far enough away so as not to overlap the parental territory. That meant moving out of the parental water basin into a new one. The entire region between Britain and the Urals could have been filled in less than 1000 years. Thereafter there would have been internal dynamics until territorial stability was achieved -- everyone knew what regions belonged to what clans and tribes. A natural human tribe consists of 5-7 bands (extended families of brothers and sisters, their children and elders). (Larger tribes require political organization, government, to remain as one.) From the Canadian evidence, the most common pattern among boat-peoples is that the 5-7 bands each owned one of the water basins of the tributaries of a large river so that the tribe as a whole owned the entire river water basin. The bands travelled through their large territories on their own for most of the year, and then they all came together once a year to socialize, find mates, trade, exchange news. The tribal meeting place was usually near the mouth of a river. In the case of peoples who fished and hunted sea coasts, perhaps a tribe was distributed along the coast, each band claiming a part of the coast. Archeology shows that there was a cultural unity along the south Baltic which they have named "Maglemose". If the bands of this tribe travelled the coast, the central location where the bands got together would have been at the mouth of the Oder as it would be a central location. And on the east Baltic the bands of the tribe archeologists have called "Kunda" would probably have met at the Dvina (Daugava, Väina) at the Gulf of Riga. The mouth of the Vistula would have been the gathering place of bands who travelled the Vistula. If the three tribes wanted to meet in a large gathering, the mouth of the Vistula was a good place. Archeology has found overlapping of archeological cultures there. Another location where it appears two or three tribes came together is Lake Onega. Humans are territorial creatures, and one clan or band could not steal resources from the territory of another, without causing a fight. Thus each clan assumed their own territory, and passed it down within the clan, patrilineally among hunters since men were most involved with hunting territory. Early farmers, however passed down farmlands matrilineally since traditionally women took care of villages, collecting plant foods, and processing. (Recent example: Iroquoian farmers of America). Later farmer-herders, starting with Indo-Europeans, were patrilineal again because the male role of defender of territory against enemies took precedence and rule returned to the male. The accompanying illustrations shows the typical manner in which a boat-using hunter-fisher-gatherer tribe would occupy a river, with each clan claiming a tributary. Annually they would all ride down the river to a tribal meeting place near the mouth. (Examples are found in recent Canada). In addition, I show the clans of nomadic hunters that move on foot, such as ancient reindeer hunters. Here too, each clan would have their own territory, but not as far apart from the others since it had to be walked. Annually or so, the clans would come together. Reindeer hunters might meet at a place they all ambush reindeer on their migrations. Thirdly there are the settlers who don't move, because they are tied to farmlands, and cannot abandon the farmlands for long. In this diagram I also happen to place the pedestrian hunters and settled peoples within the geographical area of the river-people. This illustrates that territory is not only about land area, but also nature of the activity and resources. Reindeer hunters and boat-people were not in territorial conflict because boats could not travel where the reindeer were. Settlers and boat people were not in territorial conflict because settlers grew their own food and did not hunt the wild. Of course this is not absolutely true. Boat-people probably tried to steal a reindeer now and then, and settled people might occasionally fetch something from the wilderness. Boat people might kill a reindeer or throw seeds on a clearing of land, or keep a domestic animal. That's when conflicts occurred. But usually they got along and they could co-exist in the same landscape. While it is easy to picture bands located on the tributaries of a large river (like the Oder) travelling up and down their rivers from one campsite to the next, perhaps 5 locations in a year, it is not as easy to determine how hunters would have behaved on the sea. Obviously in the Baltic (such as the "Kunda" culture) they probably kept close to the shore, avoiding the high waves of the sea, but in the arctic ocean, it was probably beneficial to move with the ocean current, expecially since this current had warm water in which sea life was abundant. The adjoining diagram is my suggestion as to how arctic Norwegian oceanic hunters probably moved from site to site with the ocean currents, at least to avoid paddling against the current. There is no need to guess at the behaviour of canoe-using aboriginal hunters in Greater Europe because proof can be found in the traditions of boat-using hunter-fisher-gatherers of Canada. The further north the people live, the lower the food density in the land, and the further they had to travel to secure their food. Thus for example the Cree around forested part of the the lower Hudson Bay, covered a territory as much as 3000km wide, their far-ranging movements keeping the language from breaking into many separate languages over that entire area. (Europeans did however note three dialects). North of them, the arctic ocean boat-oriented Inuit had established a single language, with about three dialects from Alaska all the way to Greenland. Towards the south, where food density was greater, people did not have to travel as far. Shorter-range interaction between peoples caused dialects over smaller regions and for there to be suffiencient separation between the larger groups as to develop distinct languages (=dialects that are too far apart to be easily understood by each other). For example in Canada, the Ojibwa boat-people lived throughout the Great Lakes water basin, the Algonquins in the Ottawa River water basin, the Montagnais Innu in the Saguenay River water basin, the Labrador Innu in the Churchill River water basin. Note how water basins defined the regions, since boat-use was generally confined to the water basin. Within these divisions there were dialects too, especially among the Ojibwa. To be accurate, the language varied in relation to distance, and while adjacent tribes could understand each other's dialect more distant ones had difficulty. Linguists unfortunately do not think in terms of continua of language where distinct languages only occurred where there was some kind of barrier to communication. For example in the east Baltic coast, there would have been a continuum of dialects up the east Baltic coast, but then because of the obstacle of the Gulf of Finland, a dramatic difference between the north and south side - the reason Estonian and Finnish are considered distinct languages, while southern Estonian dialects would have transitioned into the northern Livonian dialects, Livonian into Curonian, and so on. In North America, it would have been similar - the strong differentiation being caused by geographic barriers or some other basis for separation. For example the Montagnais Innu lived on the Saguenay River, so they would have to be different from the Algonqjuins on the Ottawa River. Once we understand the way the North American Algonquian boat peoples divided up their activities in the Canadian landscape we get to understand the early situation in ancient Greater Europe very well. Notably we can predict that the Ob, Kama, Volga Rivers (for example) would produce separations that would promote all their languages drifting apart from a common parent. Thus once we identify the early Finno-Ugric cultures as aboriginal boat peoples like the recent Algonquians we can predict that linguists will find linguistic differences according to the major water systems. Indeed, that is what they found - the Ob-Ugrian languages on the Ob River, the Permian in the Kama River water system, the Volgic in the Volga, and the Finnic in the waters draining into the upper Baltic. It follows obviously that if the expansion from the "Maglemose" culture of the Jutland Peninsula (Denmark) is correct, then not very long ago there must have been more Finno-Ugric families - perhaps a family on the Vistula, perhaps descendants of "Maglemose" on the Oder, perhaps a family in southern Sweden, perhaps even a Finno-Ugric family in Britain. Such notions are controversial to everyone who has fallen victim to the erroneous theory of migrations described above. The most primitive way of life among surviving Finno-Ugric cultures are also the most remote - the Ob-Ugrians on the Ob River which drains into the arctic ocean east of the Ural Mountains. Even recently clans went up the river to spend part of the year in their traditional campsites. They have been documented by the films of Lennart Meri shot in the 1980's. The films include so many primitive aspects that when I showed it to an Ojibwa friend in Canada, he initially thought it was all staged and everyone was acting. The film included icons familiar in Algonquian culture such as the drum made by stretching skin on a frame, and the teepee construction. And the territories of the ancient tribes could be enormous. In North America the Montagnais Innu occupied the whole Saguenay River system. About the time the French first arrived, they came down to the mouth and congregated to affirm the tribe. The location was called Toudessac. Interestingly, when Europeans began arriving in ships it was the Montegnais who set up a trading post to trade with the Europeans. In Eurasia the Khanti were equally enterprising. Learning of places to trade at the southern reaches of the Ob, groups made long trips southward to engage in trade. The Ob River is very large and in effect the Khanti occupied a territory as large as all of eastern Europe! We only need to project what is relatively recent in the Ob River to large rivers to the east. For example, it is easy to imagine that when agricultural people arrived (The Danubian Culture) it was not the agricultural people who travelled down the Danube to trade at the eastern Mediterranean or Black Sea. It would have been descendants of the boat peoples. Similarly other rivers would have seen the boat people easily assuming roles as traders. We can easily imagine situations in the Vistula, Dneiper, Oder, Rhine, Volga, etc. where one subdivision of the boat-people dominated an entire water basin. The following map depicts actual archeological discoveries of "archeological dialects" among the ancient peoples who were all essentially dugout or skin boat users. The graphically patterned areas represent locations where remains of a particular "culture" have been found. The map described the period of between 7500-3000BC or 9500-5000 BP (before present). This is the period of boat-peoples expansion. Note the hatched area at the bottom. At that time it would have represented a culture that lay in the Vistula water system and upper Oder. Note also another hatching for the Dneiper. Later archeology reveals the entry of agricultural peoples in these areas, but that may be misleading. Boat peoples and agricultural peoples can coexist as they do not interfere with each other's sense of territory. Moreover people tied to settlements and farm fields would welcome the service that the nomadic boat peoples offered, such as trade. Here too there are models in recent North America, in the relationship between the farming Indians, the Hurons, and the seasonally nomadic boat/canoe peoples, the Algonqians. ARCHEOLOGICAL "CULTURES" OF THE MESOLITHIC. The patterns followed by oceanic hunters are more mysterious. They may not even have had annual cycles, only meeting other bands every five years or so. The Shetland Islands lore speaks of a people they called "Finns" who were estabished for a few years on its northern islands, and then disappeared. Farley Mowat, quoted above, advanced a theory that original British who he called "Albans" endured in the Northern Isles, and hunted walrus, travelling all the way to the coast of Canada. In my theory there were always two types of boat-peoples in the British Isles, the original dugout-using interior hunter-gatherers who were orientated towards the east, became traders, and the skin-boat oceanic hunters that came down at an early time from the arctic Norwegian coast, and always remained sea-hunters, much like the Basques further south. If there was a circling ocean current, like there was north of arctic Norway, and also between Norway, Greenland, and Iceland, the movements of the oceanic hunters might have gone with the current. The collective tribal meeting place would be in the mid-point somewhere. For example the location where the "Komsa" culture settlement was found, in north central Norway, would be on the edge of a cycling current. The evolution of oceanic tribes and ocean expansion will be described further later. If we look at a map of Europe and North America side by side, as in the illustration below, and then notice the long range of the distribution of some northern language/ethnic families in North America, it is obvious that early Europe, was similar in having a single language or ethnicity spanning an enormous range purely from the factors of low-food-density and long-range boat-travel . Such a large distribution can only come about in the ancient northern world, before wars and refugees and so on, if there is a rapid expansion of a people through a land, unopposed by other people already there with similar economic ways. Rapid expansion only occurs when the expanding people 1) come into possession of something that caused their populations to multiply, and 2) their expansion was unopposed (they entered an empty economic niche). The warming climate promoted the first, and the lack of previous people in the freed (from ice) forests and marshes ensured the second. The first illustration shows the areas of the world that were covered by ice at the height of the Ice Age. When the ice melted all the wet lands were free to be entered, not by people on foot who would have had difficulty there, but by people with boats. In other words, the regions under the glaciers were to be properly inhabited first by boat peoples who could successfully live in such a landscape crisscrossed with lakes, rivers, and marshes. The second illustration shows the real situation in North America not long ago, and a probable European situation around 2500BC. The white lines show boundaries. Non-white text indicates people not boat-people, and light blue arrows suggest trans Atlantic expansions. The names in white are popular modern ones. But I also show, in cyan blue capitals, variations on names beginning with "UI-" that appear to be precedents for modern words like "Finnic" and "Venetic" and "Inuit". For a detailed investigation of the question of the original name of the boat-peoples see the next article "UINI": QUEST FOR THE ORIGINAL NAME OF THE BOAT-PEOPLES Did a boat people emerge also under the melting glaciers in North America? That is an interesting question. Did the boat-using way of life come from northern Europe or was it an independent development in North America? This was discussed earlier in this article. Note in the illustration that the "Algonquian" language family of North America is located in the forested area, as if these people were accustomed to being boat-using forest people, previous to a rapid expansion into an empty region. The "Athabascan" family is located in the prairies, but . these were not a boat people; they came by way of the Bering Strait and we can presume that they maintained a language family over a large region by being nomadic buffalo-hunters. Furthermore, by 1600 the plains peoples had horses. North of both, were the Inuit, formerly called "Eskimo". The Inuit were specialized arctic boat people. But before them were an archeological "Dorset" culture. Inland from the coast there were a reindeer (caribou) hunting people too that has now vanished. North America presents interesting problems that need their own separate focus. In the prehistoric beginnings, as the great ice sheets of the Ice Age retreated, populations would have continued to grow as long as the climate was warming. When the glacier, which was centered on the mountains of Norway became small, climate change had slowed down. The populations of boat peoples stabilized. They had expanded as far as nature allowed, and now they settled each into their water basins, and each tribe started to dialectically change within their territories because there was little communication across water basins. These small changes are reflected in archeology. We know that boat people went into the Volga, because three of the Finno-Ugric language families are accessed by getting onto the Volga. What is unknown is the situation in the Dneiper and other rivers draining to the Black Sea from the Baltic direction. Languages originally there have vanished. This map, based on geography of rivers, roughly suggests regions where water systems tie tribes together. The main criteria is rivers flowing in the same direction towards a sea. This information is important in understanding how languages and archeological data changes. The coastlines and river orientations also suggest the directions of expansion of boat-using peoples. As I said above, while humans could devise a raft of some kind probably even 50,000 years ago, they were basically land-people and the development of the design of the boat, the manner in which one travelled and hunted, etc had to be a slow process. It may have taken 1000 years or more to refine the dugout boat, determine what to hunt and fish, develop new tools and techniques, etc. Those that had better ideas were more successful. It was thus Nature that gradually selected the people and methods that worked best. More successful methods resulted in more children, more population growth, more expansion. We must not picture a sudden invention of boat use, and a sudden expansion. It could have, by chance, begun in one place, and expanded from there. It would have been a process that took at least 1000 years, probably 2000. Perhaps the crudest boat people, making only a hole in a log, and stumbling about as best they could, began in 10,000BC. Perhaps it wasn't until about 8,000BC that the new way of life in a watery landscape had reached maturity and dramatic expansion began. The idea that a boat-culture does not happen unless Nature imposes pressures forcing humans to make it happen, or that it does not happen overnight, leads us to ask whether boat peoples in other parts of the world were independent evolutions, or whether they all acquired the basic culture from the boat people under the north European glaciers. We have already touched on this earlier. Since humans are land-creatures, the development of a boat-oriented way of life required strong pressures to force humans to act against their instincts. I have referred to the Inuit (Eskimo) of arctic Canada. Their boats were made of skins and included a one-person craft called a kayak and the other a large vessel that would carry an entire clan, called an umiak. To their south in the subarctic forests there were the Algonquian boat-using hunter-fisher-gatherers who travelled up and down the rivers. They included Cree, Ojibwa, Algonquin, Montagnais, Innu, etc. Their boats were made by covering a frame with birch bark. The birch bark canoe can be viewed as a form of skin boat. Algonquian peoples towards the south along the Atlantic coast also demonstrated dugout canoes and skin boats using moose-hide. Were these boats independently developed or did the prototypes come across the North Atlantic? There are many similarities between the culture of the Algonquians and what is found in Finno-Ugrians. This question calls for further discussion in another article. Since humans were not naturally inclined to live on open water, I believe that boat people began as the dugout peoples who stayed close to coasts and within rivers and marshes. Peoples who sailed into the oceans and seas developed a little later. For example evidence of boat-people off the coasts of arctic Norway, does not really appear until about 4000BC. Currently archeologists have rationalized that they came there by coming up the Norwegian coast. By why would they travel north in ocean waves along a forbidding shore with glaciers in the distance, when there were plenty better places to go? This and other similar common sense arguments suggest that the original sea-hunters of the Norwegian coast came from the east, via arctic Norway. See MAP 2 which shows how the regions around the White Sea and Kola Peninsula were ice-free. What group of people would have travelled north along a glacier coast, with nowhere to land?! Once the sea-hunters were estabished in arctic Norway, and the glaciers had exposed the shore, approaches were also possible from the south. We are here interested in the beginnings. If we consider the beginnings, that is the first boat-peoples in the Norwegian arctic, then we have to conclude they came from the east over top of Norway, from around the White Sea. Then that opens another question - how did they get to the White Sea? The answer is clear in the rock carvings at Lake Onega. They show a skin boat made of moose hide, with the head on the prow. 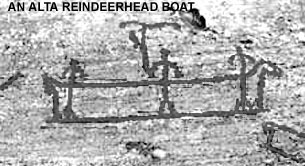 Rock carvings in arctic Norway include examples of exactly the same boat- with moosehead. Since moose does not live in the arctic, the people who used them must have originally travelled to the arctic coast from someplace towards the south. The next question is, how did they get to Lake Onega? There are many reasons to believe that oceanic hunters of arctic Norway originated from the east, from the White Sea, and Lake Onega. Humans do not adapt to something that is as unnatural as dealing with the open sea very easily. There had to be strong pressures forcing boat people to take into open ocean waves. Such pressures would have existed in the north where food density was low. Thus, I believe that the original boat-people on the coast of arctic Norway came by way of the White Sea in skin boats. Rock carvings found at the Norwegian island of Sørøya, show images of a light dugout, too small for ocean waves, but also a high-prowed vessel with a moose-head prow ("moose" is an American word of Algonquian origin for what is "elk" in British English). I believe that this moose-head boat was a skin boat made from the full hide of a moose, slit along the back, frame inserted, leaving the head attached for spiritual reasons. These people obviousy also had dugouts, but, like the Khanti dugouts, were too small to navigate in open seas. Possibly the Inuit kayak , which enclosed the top to allow waves to break over the top, was in effect an adaptation of the tiny one-person northern dugout, to deal with high waves and could be built without need for any tree. If the boat was made of a moose hide, it meant the people had to winter in a place with moose, in the forested zone. It is common sense that since the arctic was cold and dark in the winter, early visitors to the arctic did not stay there through the dark winter. They all returned to a more southern place. Lake Onega was an ideal wintering place for boat people dealing with the White Sea and beyond. It was also a place to hunt moose and make more boats. A representation of an image found at the rock carvings at Russia's Lake Onega. 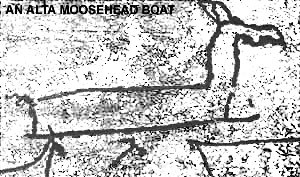 There are larger boats depicted but we are interested in the smaller version that appears to be able to hold a maximum of three men, and the moose head size relative to the humans suggests a real moose head. The photo from which the above illustration is made. 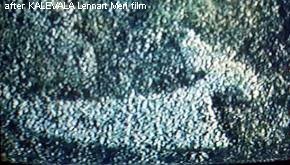 It is taken from a frame of the film "Kalevala" by Lennart Meri, as shown on Finnish and Estonian TV. A representation of a similar image found on Norway's arctic island of Sørøya where ancient visitors appeared to have hunting the sea-life of the warm waters of the North Atlantic Drift. The carvings also depict a rather small and thin dugout. Both suggest that the people came from a place with moose (Brit. "elk", Est. "põder") and reasonable size trees. The photo of Sørøya rock from which image taken. Note this rock carving also shows the small single-person dugout (still made by the Khanti on the Ob). These people obviously used the larger skin boat for the open sea, and the dugout for calm water. The dugout eventually was replaced by the kayak. What is peculiar is that some of the rock carving images at Lake Onega show sea-harvesting activity that would only occur in the arctic ocean, not at Lake Onega, as if they were picturing last summer's activities. One image, for example shows the catching of a seal. Meanwhile, the Sørøya carvings show images of forest animals, as if when there, they reminisced about their other home, their winter home. Archeologists have puzzled why the Sørøya carvings do not show their activities at that location, but forest animals - the answer is obvious: homesickness. They must have divided their time between summering on the arctic Norwegian coast and wintering in the forests such as at Lake Onega. In the annual cycle of nomadic hunters, entire bands, including women and children, moved together from camp to camp and they did not have to return to the same place until the next year (or whatever the length of their nomadic circuit.) Thus they could all move six months away from their wintering location, and six months back. In actual fact, the time distance from Lake Onega to the warm waters of the Atlantic Drift, was about a month or so. We cannot underestimate the distances humans will travel on the ocean, considering that in the 16th century Basque whalers were regularly crossing the Atlantic in sailing ships to harvest whales off the Canadian coast. The next stage in the evolution would obviously be that some groups decided not to go back into the forest, but to remain in the north, biding their time in the dark until the sun returned. This would have been possible if they had caught enough meat to store for winter use. In the winter it would not spoil. They may also have interracted with interior reindeer people and copied their ways of dealing with the dark winter. It is this interraction that from both intermarriage and cultural sharing, I believe produced the Saami - linguistically Finnic, but displaying genetic roots (esp among women) from the east (ie the Samoyeds), and reindeer harvesting practices. These people, no longer returning to the White Sea or Lake Onega area, with success and population growth, were able to migrate further in search of new sea-hunting places. Some breakaways, would have migrated south to the outer islands of Britain becoming ancestral to the seagoing "Picts" who history records having skin boats. (We must not confuse the aboriginal short, seagoing "Picts" with the "Picts" history defined as peoples settled in northern British Isles before the Celts arrived who were probably original British from the dugout traditions. The eastern and interior parts of Britain would already have been established with the original dugout-boat peoples and traditions, but the seas had until that time been an empty niche. After the skin boat seafarers, the "Finns", had spread through the outer and western parts of Britain to harvest a branch of the Atlantic Drift that turned towards the northern Isles, then perhaps some migrated further south, possibly ending up as far south as Portugal, possibly inspiring the legends of "Atlantis". They would have become the founders of the Atlantic "Megalithic" culture, a culture that built hill-tombs and alignments of large rocks not far from the coast (meaning they were a people who followed coasts). The "Megalithic" culture, as some scholars have called it, gradually spread up the western European rivers establishing the culture throughout western Europe. The key question as to where the migrations went relates to the ocean currents and sea-life they harvested. In the north, the bountiful places were located where the North Atlantic Drift (originating on the American side as the Gulf Stream) came up to the west of Britain, past the northern Isles, with a branch turning eastward between the northern Isles. This ocean current then headed towards arctic Norway, passing the Lofoten Islands, and into the Norwegian arctic islands. The story is clearer about the others of the arctic Norwegian sea-hunter traditions, who migrated across to Greenland and Iceland and further, becoming the archeological "Dorset" culture of the Canadian east arctic. Canadian archeology reveals the "Dorset" culture has affinities with northern Norway archeological culture, and had expanded east-to-west across the Canadian arctic reaching the location where later a "Thule" culture started coming back the other way. (Was "Thule" ethnically a daughter to "Dorset" or the original White Sea culture coming to the Canadian arctic having travelled in the other direction over top of Siberia?) The "Dorset" culture appeared around 3500 BC, which coincides with the time of the "Komsa" culture that stayed in the Norwegian north instead of migrating north-south. Conclusion: The "Dorset" culture arose from the "Komsa" culture of arctic Norway. If we look at a map of the world's ocean currents, it becomes very clear what happened. Considering that the early oceanic boat people had small skin boats and were probably not particularly evolved in the use of sails, they must have simply followed the currents. A map of the world's ocean currents can give us a good idea where early ocean-travellers without navigation skills or sails might have travelled. Below we look only at the North Atlantic. The above map shows how the Gulf Stream, also known as the North Atlantic Drift, crosses the open part of the ocean from the American coast below Newfoundland, and heads to the waters of arctic Norway, then the currents turn in counter-clockwise circles. These circles could be exploited by oceanic hunters, to create a circuit to follow annually or over a longer period. The main circuits are given above by letters A, B, and C. The first oceanic boat people, those coming to the White Sea with moose-skin boats, could have travelled in circuit A, because such a circuit would have brought them to the region of Sørøya where moose-head boat images are carved. The archeological "Komsa" culture too lay on the edge of circuit A. Significantly, the regions of the Norwegian coast where some 3000 images have been found carved on rock, at Alta, Norway, and which has since 1985 been declared a World Heritage Site, lies close to the junction of circuits A and B. Furthermore Alta lies at the mouth of a river that extends inland--meaning all interior boat peoples could travel there too. If the culture in circuit A was successful, its population would have grown, and a break-off group would have wandered out of circuit A in the direction of Greenland and soon found themselves in circuit B. The home base for this circuit was perhaps the Lofoten Islands area. Circuit B would also have had a camp at the east end of Iceland. Note that, although the British Isles are somewhat towards the south, history shows that seagoing "Finns" appeared at the north end of the Shetland Island. Clearly they would have belonged to circuit B. Such people stayed several years, suggesting the tribe did not meet annually but over longer periods of time, so that the bands would not need to travel this large circuit within a year. Finally, by breaking out of circuit B towards Greenland, groups could have travelled towards Davis Strait, and found themselves in circuit C. Evidence suggests that Greenland Inuit whalers of the 16th century did indeed follow this circuit. Earlier, the "Dorset" culture may have travelled in circuit C. But note that while circuit B will allow return to th Norwegian coast, once groups reach circuit C, they cannot easily go back, except by paddling against the current near Greenland, or by travelling for a month across the open Atlantic. This need to travel for a month or more through the open Atlantic meant that IF boat-people had arisen in North America, it is unlikely anyone who got caught in the Gulf Stream would have been prepared with adequate food and fresh water to survive the trip. For that reason, we have to view North America being visited by people across the North Atlantic, not the opposite. The rock carvings at Alta, Norway, were pecked into granite, from 7000 to 2000 years ago, and much of it portrays inland animals that could be accessed by heading inland. At this latitude there is a river from the interior and no mountain barrier. It could have brought Finnic forest boat-peoples to the coast in summers. As at Lake Onega, there are many depictions of boats, large and small, and the act of fishing, sealing, etc.The earliest moosehead boat is shown. Compare with the moosheadboatimages above. What is evident is that in due course the Alta area was perhaps settled and so moosehead boats were replaced by reindeerhead boats. People often fail to notice the reindeer head. This is very important as it is the origin of all traditions of an animal-head (sometimes seen as a "Dragon-head") at the prow, including those in Japan where it must have arrived via the Ainu aboriginals of Japan. The tradition of a skin boat honouring the head of the animal, apparently in earlier times was carried on even when the animal was walrus. Many Inuit walrus-skin umiaks had the walrus head at the prow. The tradition was apparent even in the 18th century in the British outer islands in the boat the Irish called curragh The adjacent image reproduces a section of a drawing of such a boat. By that time, skin boats were made of ox-hide, and so as we would expect, there is an ox head on the prow.The significance of the curragh having the head at the prow is that the sea-harvesters around the British Isles, were part of the same cultural and probably linguistic milieu as all the other skin boat peoples, and thus the original language and culture around Britain was of a Finnic type, ie derived from boat peoples rather than land-based Europeans. 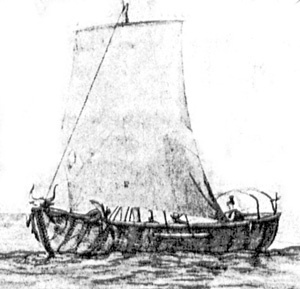 Portion of an 18th century drawing of an Irish "curragh" "A portable vessel of wicker ordinarily used by the wild irish" from picture reproduced in F. Mowat "Farfarers" p 19 (Toronto, 1998) Mowat estimates it to be 36ft in length and covered in ox-hide. Note ox head on prow proving its relationship to prehistoric Norwegian skin boats with head of owner of skins on the prow. When we consider Alta in relation to the ocean currents, it is clear that there must have been, by accident or design, north Atlantic crossings through the millenia, basically taking the same route as the Icelandic Norse did around 1000AD --going with the currents and winds, and preferably keeping land (ie Greenland coast) in sight. In other words there is no reason for us to believe the Norse were the first to accidentally hit the North American coast!! If there were Atlantic crossings that contributed to the Inuit or Algonquian cultures of northern North America, this Alta region, could very well have been the origin of the voyagers. The map above, thus includes the location of Alta, to show how logical it is to propose that there has always been a trickle of ocean crossings for 7000 years. If this is so, then images of skin boats, with their characteristic animalhead thing at the prow, should appear in rock art in the Algonquian region of Canada. Although some of the images can be argued to depict recent rock paintings of recent European boats, there are some images that are quite old and have the required characteristics of a north Norwegian skin boat -- prow has a head and goes straight down, instead of being curved like a wooden boat. It is possible that people arrived in skin boats and then changed to dugouts (or invented the birchbark canoe) for going into the interior. 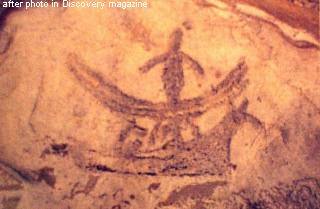 The above image from one of the older Canadian rock painting sites at Bon Echo appears to depict a skin boat with an animal head. Note the shape of the boat is consistent with skin boats at Alta, that is, the bow goes straight down. There is no question this is an Alta type skin boat much like the one shown in one of the illustrations above. It is reasonable to assume that the earliest migrations were current-dependent. Reading the currents would let them navigate well and less effort was needed. Knowing the currents, if they did nothing but drift, they would end up back in familiar territory. Later sailing away from the currents complicated matters, because the sailors were now departing from the rock solid patterns of ocean current, and dealing with less certain behaviours of the wind. For that it was necessary to develop navigations skills that ascertained position with the help of counting the days and looking at the sky. That came later. The following map shows the manner in which oceanic peoples would have spread from the White Sea area, westward over top of Scandinavia and then, with success, continuing into empty niches in the ocean. As in the case of the expansion of the original dugout boats, we assume that initially the oceanic environment originally has no humans, so that expansion from the arctic Norway region is unopposed. The map above develops further from the previous map which depicted the initial expansion of the dugout boat peoples. This map primarily adds the expansion of oceanic people using seaworthy skin boats (lighter blue). It also proposes some specific zones of the original boat peoples. Some explanation is needed: "Brito-Belgic" refers to boat peoples around the coast of the North Sea and into the Rhine. The gathering place for this tribe would have been the Rhine; "Suevo-Aestic" refers to the south Baltic zone, that in later history was occupied by the tribes the Romans called Suebi or Suevi, and the Aestii of the eastern coast (both of which were originally Finnic). Their major congregating site for them was at the mouth of the Vistula. Archeologically speaking, the Maglemose culture, associated with the earliest boat peoples, would include both the "Brito-Belgic" and "Suevo-Aestic" zones. Archeological study would also identify a "Volgic" group, whose extent reached up to Lake Onega, and interracted with the Finnic groups at Lake Onega. (Interraction of several cultures is evidences by overlap of artifacts in the same area.) Archeology has also confirmed a "Megalithic" culture that went from Portugal, up to the British Isles and by 2000BC also across to northern Denmark. The only speculative detail in the map is the choice of calling the people who occupied rivers that drained from the north down into the Black Sea as "Venedic". See the next section for some comments about "Venetic" traders that developed from boat people exploiting their familiarity with boat travel for trading purposes. 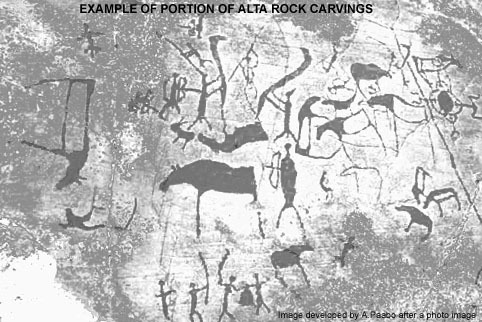 The evidence that the main base for the expansion of oceanic boat peoples was at Alta, Norway, is indicated by a great abundance of rock carvings have been found there including images of men harvesting the sea in boats with both moose heads and reindeer heads. There are also images of hunting reindeer from boats as they cross water. This region of Norway has been the traditional home of the "Finns" and northern Norway was called "Finnmark" (just as the region Sweden claimed that was inhabited still by natives, was called "Finnlanda") The term "Finn" used in the Germanic languages of historic Norway and Sweden, was a term that generally referred to the aboriginal peoples of Scandinavia. This included people who hunted in forests, harvested the seas, and tended to reindeer herds. The first two - the seacoast people and the interior hunters - were truly of boat-people traditions. The third group, the one who tended to reindeer herds and who today refer to themselves as Saami are and were a little different, in that they were not boat peoples. Indeed their reindeer-dependent culture obviously originated from the same ancestal reindeer people as the Samoyeds towards the east in arctic Russia. What happened? I think it is a very simple matter. Originally arctic Scandinavia only had the reindeer people in the interior, following their reindeer herds. And then around 6000 years ago, with the development of the skin boat, and the discovery of harvesting the ocean off arctic Norway, boat people moved in, first staying seasonally, and then staying permanently (ie Komsa Culture). A situation developed (looking at the Komsa situation), in which sea-harvesting skin-boat people, were found along the coast, and reindeer people in the interior. Because they each had different ways of life, they were not competitive, and contacts would have developed between the boat people and reindeer people as long as each respected the other's sense of territory. In the large spans of time, the two groups would have merged through intermarriage, resulting in the Saami. The modern Saami clearly reflect their mixed origins. On the one hand they maintain reindeer-management traditions that are very ancient, and on the other hand, their appearance is quite European now, and their language is so Finnic in character that it has been included in the Finnic languages. Unlike some scholars, I don't find the origins of the Saami to be a particularly complicated problem. Common sense says that originally there must have been reindeer hunters following reindeer herds, who originated from the same stock as the Samoyeds to the east who also still maintain reindeer. And then Finnic boat peoples came up from the south, and eventually many stayed there, to intermarry with reindeer hunters. This did not happen towards the east, in arctic Russia, because the expansion of the Finnic skin-boat peoples was biased in the westerly direction where the warming Atlantic current nurtured an abundance of sea life in arctic Norway. However in the east, when the boat peoples went north from the Volga into the Kama, it is possible that there was intermarriage and cultural exchange there too, with the reindeer hunters, but to a lesser extent, and the Ob-Ugric languages may be more Samoyedic than Finnic. Of particular interest is that geneticists have found that the mtDNA among the Saami, that is carried only along female lines appears to have affinity with that in Samoyed women - which would be consistent with the boat peoples males taking reindeer people women as wives whereas the reverse (reindeer hunters taking boat-people wives) would not be true. Reindeer people men might not find women who knew how to clean fish to be very useful. During the great expansion of boat peoples, all the rivers that emptied into the northern seas were highways that could be used to travel into the interior of Europe. As the boat peoples paddled up the rivers, the waterways became smaller, and soon they were prevented from continuing where the creeks and springs were too small for boats. Unless they wanted to drag heavy dugouts through the forest to the next water system, they did not go further. However there were some places where entering another water system that drained south was easily done from the northern water basins. One example might be the transfer from the Rhine to the Danube. But the easiest southward flowing waterway to enter from the north was probably the Dneiper. Rivers draining into the Baltic and rivers draining into the Black Sea seem to have shared source waters, the same marsh areas. Thus it is valid to propose that the boat people originally occupied the entire region from the Baltic to the Black Sea (shown in Map 3 as "Venetic") Note that the Dneiper and rivers like the Bug and Dneister, all flowed to the Black Sea. One of the implications of this is that boat-people on these rivers were most inclined of all of the boat people to make contact with the farmer-herder peoples and their civilizations in the south around the Black Sea. For this reason, I believe that they were the origins of the Venedi/Veneti who appear in Homer's Iliad as the "Eneti of Paphlagonia", the region on the south coast of the Black Sea, on the west side. They came to the aid of Troy. Troy's location at the entry to the ancient Hellespont by which ships sailed from the Mediterranean to the Black Sea, is good reason for coming to its aid, if the Eneti were traders. It is because boat-people in the Dneiper, Bug, and Dneister had easy access to the Black Sea area and the developing farming civilizations there, that I have covered these river water basins with the "Venedi" designation in the above map. Volga too was used for trade: the Volga flowed into the Caspian Sea but one could get from the Volga to the Black Sea. as well. Obviously, southward travelling boat people encountered land-people in the south engaged in farming activities. But there would not have been any conflict in their meeting. It is important to bear in mind that boat-people and land-people can co-exist because they live in different environments and economic activities . On the other hand. hunting people fought hunting people over hunting territories. Farmers fought farmers over farmland . Fisher-people fought fisher-people over fishing ground. Reindeer people fought other reindeer people who attempted to take an animal from their herd. But people in different circumstances from one another had no basis for quarreling. In North America, the native hunter-fisher-gatherers of the wilderness were never directly in conflict with the European settlers. Still, they came to an end passively by the settlers cutting down the wilderness when they made farmland. It is interesting to note that the major objecttions to the arrival of settlers came from the Iroquian Natives, who were themselves farmers. The Algonquian hunting peoples had less conflict with settlers - until the settlers destroyed the wilderness. Moving from the Black Sea towards the Vistula it was a very marshy landscape, not very attractive to farming. But going north beside the Dneiper one found high ground. It was over such high ground that , later in history, farmer-herders moved and settled, in several waves, the last wave being Slavs pushing out the Balts of an earlier wave. Other expansions followed the central European highlands towards the region now Germany, as well as south into the Alps. Thus peoples living in their separate economic niches, co-existed. They did not need to dominate the other as would be the case if the two had been similar, trying to claim the same economic niche. But in the long run, after many generations, the two dissimilar peoples could combine the best of their two cultures and produce a new one that was superior to the original two. (I have already discussed above the obvious merging on boat peoples and reindeer peoples in arctic Scandinavia, giving rise to the reindeer Saami.) But it would only develop if the combined culture was better than the original ones in their pure form. The resulting mixed culture, if it were more successful, would produce more offspring and crowd out the older distinctive cultures. The ethnicity, the language, of this mixed culture would depend on which tradition was the most important in the way of life, forming the core of the mixed culture. In the north Baltic area, for example, the successful result was a combination of hunting-gathering-fishing plus a settlement with limited farming, plus trading. A little of everything. In other instances, the pure original culture was the best, and two different peoples would endure side by side. An example would be the boat-oriented trader whose nomadic life on water, was so opposite to that of the farmer, that any compromise would reduce the ability of either to do their job well. It may be the reason the Saami have survived among all the aboriginal peoples of Scandinavia while the rest - seagoing and interior "Finns" - have become absorbed into the Norwegian and Swedish fabric. So far we have been looking at Europe and the north Atlantic. There is no question that the boat-peoples expanded everywhere that their boats woud take them. This map of the world ocean currents suggests the paths of oceanic migrations. The most applicable currents are those that follow coasts as then the seafarers can land to replenish supplies. Note that when the world is shown in a rectangular fashion the top and bottom of the map stretches the continents. In reality distances in the arctic are much smaller than they appear here. See Figure 9 above. The most interesting observation that can be made of the above current map, is that once there were boat capable of ocean waves - and the arctic skin boats fit that requirement - migrations throughout arctic waters was easy as land was close together. The notion that there were contacts by boat, between Europe and North America via the North Atlantic, or between east Asia and North America via the North Pacific, at the earliest times, is so obvious that one wonders why it has to be debated. If we show that there are certain words in common between Finnic languages and Inuit language, should we be surprised? And yet, scholars feel it is controversial and not obvious and needs to be debated. In my view, this theory, as presented here, should not even need to be a large issue. It is so obvious. All we need to do is to establish that there were seaworthy skin boats in arctic Norway some 6000 years ago - and this is clearly evidenced in rock carvings; that there were people who harvested the sea; and that there were sea currents that would have helped men in such boats to venture towards North America into the North American arctic and down the Labrador coast. Every requirement is present. It is true there may be a need to debate crossings through the centers of the oceans. Even oceanic boat peoples tried to remain on courses that brought them to the shore where they could find fresh water and food.. Crossing the centers of oceans and not seeing land for weeks would required plenty of fresh water on board, as well as food. Did Polynesians cross the middle of the Pacific? Did sea peoples from the Iberian coast cross the middle of the Atlantic to visit the Bahamas? Were the latter "Atlantians"?. There is plenty to debate when we consider crossings through large spans of open water. But there is no reason to debate the prospect of seaworthy skin boats following the edge of sea ice, the coast of Greenland, and allowing ocean currents to carry them. It is obvious even without plenty of additional evidence. Following the northern coasrts, there was plenty of places to land, to fetch fresh water (or freshwater snow), and to procure food along the way. There was nothing to hinder circumpolar adventures if there were men with an adventurous spirit (or indeed, men who got lost, but were still able to survive off the land and sea.) The idea that ALL original arctic peoples were basically the same people, from the same origin, should be an established obvious fact in our body of knowledge. There is plenty of additional evidence in folklore and technology - where we see parallels for example between the Inuit and arctic Asians. We have focussed on the evolution of boat peoples in northern Europe and their expansions, including by sea across the North Atlantic. However, they certainly also travelled across the top of Siberia, and down various rivers that drained into the arctic. We need to look closely at the large rivers that feed into the Arctic Ocean. The Ob River system still has Finno-Ugrian water people on them - the Khanti. They still have dugouts, and their traditions speak of long trade journeys into Mongolia and northern India. The Hungarian language is closest to them, but how the Hungarian language came south to where is is now has not been considered to any great extent. To the east of the Ob, is a similarly large water system, the Yenisey. Together the Ob and Yenisey hold a vast region of swamp where water-people could have flourished. Does this explain the similarities between Finno-Ugric and various "Altaic" languages such as Turkish? Boat peoples could have easily travelled as far as the Altaic mountains. The third major northward-flowing river is the Lena. It reaches south to the vicinity of Lake Baikal. Also, at the curve of the Lena, the tributaries are such that it would not be very difficult to cross over to the Pacific, if a water people every tried it. The Lena River has produced interesting rock carvings and paintings depicting people in boats who were very interested in moose (British "elk"). This too is a subject for further study, especially since the rock carvings and paintings bear similarities to ones already described, in Alta, Norway, and on rock walls in northern North America.. The story so far is what is revealed by archeology. But how does it relate to the linguistic landscape? Today, the regions where the Maglemose Culture began - Denmark, Britain, the shore between them - have Germanic languages. These languages were imposed by Germanic military conquests occurring during the Roman Age and a few centuries afterward. The original pre-Germanic language is unknown, except that Swedish and Norwegian histories speak of "Finns" as their aboriginal peoples. While for many decades modern scholars have tried to separate modern Estonians and Finns (speakers of Finnic languages) from the "Finns" of historic Scandinavia, even though Sweden ruled the region now Finland and had called it Finnlanda. Somehow it was assumed by naive scholars that somehow the modern Finns were immigrants and the real Finns were identifiable with the Lapps, formerly known as Finns, today known as Saami. But since the Saami language is close enough to Finnish to be classed as a Finnic language, it has always made most sense that the entire Finno-Ugric languages across the north as far east as the Ural Mountains has the boat peoples at their roots. This is supported by plentiful mythological and cultural imagery connected to water, water animals, and journeying in boats. The disconnect in the scholarly world was caused by a quite erroneous theory invented and promoted by late 19th century linguists, as I mentioned above. Those linguists could only observe similarities and differences between languages and establish linguistic distances from one another. Back then linguistics was fond of creating language divergences from migrations and describing them as family trees with plenty of branching. Linguistics did not know how to deal with natural continuous adjustments between established neighbouring languages or dialects, which includes continuous convergences and divergences at the same time according to contact patterns. Without any archeological information at that time about the expansions out of Europe, these old linguists failed to consider similarities between Ob-Ugrian and Samoyedic could have been the result of convergence (from contact, intermarriage, trade) and not divergence from a common ancestor. These old linguists also assumed the family must have begun at the Urals because the peoples at the Urals were primitive whereas those at the other end, the Estonians and Finns, were civilized. How would it look if the theory placed the origins with the Baltic Finnic peoples? The old linguistic theory is something like Britains myths about original Britain being founded by a great invasion by Celts, before the Romans. No other science supports it, and yet back a century ago the idea became so entrenched it cannot go away. To summarize: the boat peoples expanded to the Urals from the Maglemose and Kunda Culture. The proto-Finno-Ugric language family was established throughout. Because boat peoples were somewhat confined to river systems, they had a little less contact with those in other river systems, and this lack of contact allowed more divergence than convergence and each water system developed its own dialect. As time went on and the peoples within the water systems settled down, stopped being so mobile, the dialectic region broke up into several internal dialects and eventually we had what we have today - Finno-Ugric subfamilies each defining water systems - Ob-Ugrians in the Ob River, Permic speakers in the Kama River, Volgic in the Volga, and Baltic Finnic currently around the northeast Baltic. Some Finno-Ugric languages have disappeared. If it originated ultimately with the Maglemose Culture, then in earlier times these languages were found in Britain to the east Baltic as well. For example, native British could have been Finno-Ugric. Denmark and the south Baltic, we know, once spoke the Suebic language which could have been one of those "Finn" languages mentioned in Swedish and Norwegian history. Some linguists have overcome this problem in the original linguistic theory by assuming the ancestral "Uralic" parent was widely distributed not at a tight location at the Urals. Imagine if all the reindeer peoples spoke the ancestral Uralic parent. Then the events described above, of how reindeer hunters split into the boat peoples on the one hand and the continued reindeer people on the other, would be the founding event. Then the old linguistic model would be somewhat correct, except that the beginning or the "Euralic" family would occur in northern Europe and at 10,000 years ago, not 5,000. The "migrations" of the old model would be the net result of continuous action over several millenia and not singular events. Because most of the theory is based mostly on commonly accepted information, most of the information for which references are not given in the text, come from most textbooks, etc. One book as being very important: Eesti Esiajalugu, Jaanits et al, 1982, Tallinn. Other special sources of data, pictures, quotes are given immediately within the text.